If you asked me what’s my favourite breakfast, I wouldn’t hesitate to vote for supreme soy sauce fried noodles (aka supreme soy sauce chow mein, 豉油皇炒麵), going with a bowl of hot porridge, that I often enjoyed at primary school age in Hong Kong. It's often sold by street hawkers at that time. 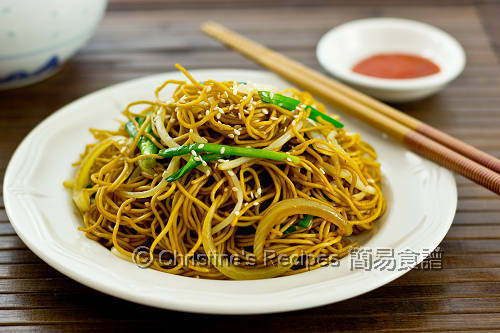 You can easily find this fried noodle dish at Cantonese dim sum restaurants nowadays. Every strand of the noodle is evenly coated with the sweet soy sauce. It’s simple, yet delicious. Although I was quite small then, I quickly recognized which stall offered the best soy sauce fried noodles. Some stalls might fry the noodles with too much oil, so it’s too greasy, whereas others might be too mushy, or too salty, or lack of soy-aromatic sauce as they didn’t use the best quality soy sauce. It’s a dish can be made within minutes. All the ingredients needed are very simple. I decided to attempt at home the other day, as my husband is also a big fan of supreme soy sauce fried noodles. You could imagine that I felt a bit of pressure and held high expectation of myself. Luckily, I successfully created a dish that entertained the taste buds of both of us. The smoky hot fried noodles, coated with salty and sweet soy sauce, mixed with the crunchy bean sprouts and chives were definitely worth attempting. Combine all the ingredients of sauce well. Make sure the sugar is dissolved completely. Set aside. Blanch the noodles in boiling water according to the package instructions. I only cooked the noodles for about 1 to 2 minutes. Don’t over cook it as you don’t want your noodles turn mushy. Use a pair of chopsticks to help loosen the noodles. Drain well. Set aside. Heat oil in a wok over high heat. 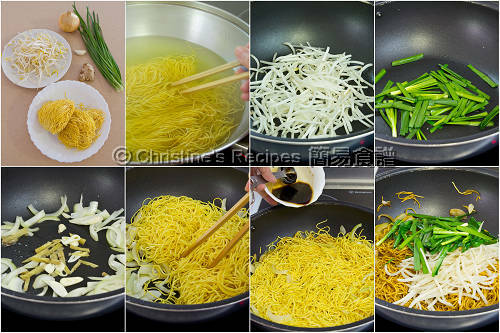 Quickly stir fry the bean sprouts and chives until slightly softened. Dish up and set aside. Add oil in the same wok. Saute the onion until translucent. Make sure not to burn it. Push the onion to the sides of wok. Add more oil in the middle. Saute the ginger and shallot. Toss in the noodles. Use chopsticks to help loosen them. When the noodles are heated enough, sprinkle the sauce in a steady stream and combine the noodles well. When you’re satisfied with the colour and taste. Toss back the bean sprouts and chives. Quickly combine well. Dish up. Top with some sesame seeds for garnish. Serve immediately. The fried noodles shouldn't be too wet or not too dry. By using a pair of chopsticks, you can easily stir to combine them well with the sauce. There are often two kinds of egg noodles available at Asian grocers. One is for making noodle soup, the other for stir fry. Get the one for stir fry to make this dish as it won’t easily break apart while stir frying. Bean sprouts will release some water while stir frying. It’s better to stir fry them separately beforehand. The upside of stir-frying the chives separately is that you can easily control the doneness, retaining the crunchiness, yet just right to remove the raw taste. To get the best results, try to get raw sugar. It brings up a natural sweetness in the sauce. If it’s not handy, you can use white sugar anyway. It looks delicious. I'm drooling by looking at it. I love this dish but feel imtimidated to cook. Thanks for the recipe Christine. I will definitely give it a shot. Hi Christine, great recipe. Just one question, what is raw sugar? Is it different from white/brown sugar? Raw sugar is so different. It's golden in colour, very natural. Take a look at the raw sugar I used if you're interested. I love this noodle dish - it's my favourite and I often order this at cantonese restaurants. It looks like this recipe calls for a good quality soy sauce. I would like to ask (if you dont mind), what is your recommendation for good soy sauce for this noodle ? I used Lee Kum Kee soy sauce (no preservatives) to make this dish. This was so easy to make! I love these basic Chinese noodle recipes they are great for college students! I added bok choi and mushrooms and it was delicious. Good idea. 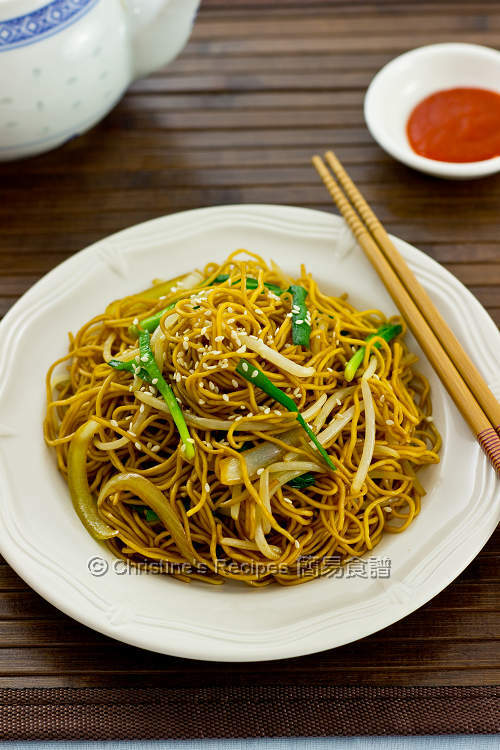 Bok choi and mushrooms are good choices for making fried noodles. It's hard for me to get fresh egg noodles here, can I use spaghetti/thin spaghetti to make this dish? Would the outcome be completely different? The taste and texture of spaghetti are very different from the egg noodles. If you can't get the fresh ones, try the dried ones. try the dried ramen noodle from the Japanese market. I think you'll be pleasantly surprised! Thank you for this recipe! I tried it for the first time last Saturday and it was so delicious that I'll be making it again this weekend! Thank you so much for this recipe. Best noodle stir fry I have ever made. I subbed green onions for chives and bok choy for the bean sprouts. Perfect. Loved by kids as well. Thank you for the recipe!! Yummy yummy I wanna try it immediately at home! Normally, the fried noodle cakes are dried. We have to boil them for a while to loosen them up, then rinse and drain them first. Hello :) Thank you so much for sharing this recipe. I really love this one so simple yet the taste is rich.